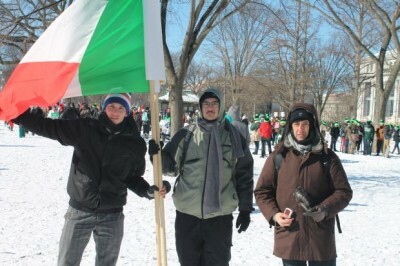 It is billed as the biggest pro-life event in the world, and justifiably so. 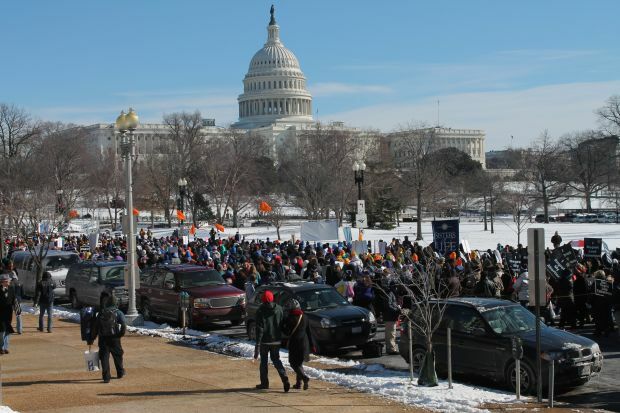 Ever since the U.S. Supreme Court’s Roe v. Wade decision in 1973 legalizing abortion in the United States, crowds usually in the hundreds of thousands have been marking the Jan. 22 anniversary by flocking to Washington, D.C., to rally in support of life and march to the Supreme Court building. They will do this until the decision is reversed or hell freezes over, whichever comes first. Whatever the condition of the nether regions this year, the Eastern United States were certainly snowed under and frozen over. Did it put a dent in the crowd? Well yes, but not by much. Looking at the crowd it seemed clear that the largest segment was from the Washington, Virginia and Maryland area and the second largest group included people who came a great distance and were already on the road when the magnitude of the storm became known. It was areas like Philadelphia, already in the storm zone the day before, where for safety concerns there were massive cancellations. That doesn’t mean the Archdiocese of Philadelphia was totally unrepresented. For example, there were two buses from St. Andrew Parish in Newtown, Bucks County. “We worried about it and we prayed about it,” said Peggy Bradbury, the organizer for the parish. The group, which included about 59 people on two buses from St. Andrew and surrounding parishes, left Newtown about 6:45 a.m. and arrived at the Basilica of the National Shrine of the Immaculate Conception at about 9:45 a.m., which was in time for two priests on the buses, Fathers Ken Brabazon and David Friel, to concelebrate at the 10 a.m. Mass. Because there were fewer Philadelphians at the rally they did not stand out. However, Maureen Smith, who was wearing a Phillies cap and carrying a Phillies backpack, certainly stood out in the crowd. As for the March, “I’m here to give reverence to every human being made in the image and likeness of God,” she said. At Villanova University, it was touch and go whether or not they would come to Washington. As it was, about half of those originally scheduled for the trip could not come and in the end there were 50 in the group. There were also touches of Philadelphia where least expected. Howard and Patricia Schultz came down from St. Columbkill Parish, Boyertown, in the Allentown Diocese. “We left around 7:30 a.m. and got here around noon,” said Howard, who is a candidate for the permanent diaconate. When informed they were being interviewed for CatholicPhilly.com, Howard said, “We used to live in Philadelphia in St. Leo Parish, Tacony.” It’s a small world indeed. Steve and Holly Day have absolutely no Philadelphia connection but their family of three little children, Jane, Jacqueline and Elizabeth, smiling in spite of the bitter weather, was absolutely irresistible. 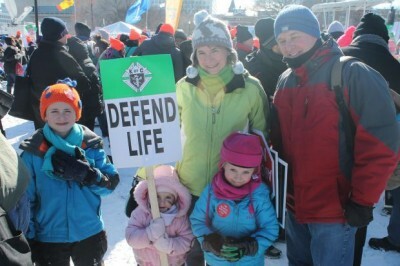 Steven Bozza, director of the Archdiocese of Philadelphia’s Office for Life and Family, was multi-tasking in Washington. 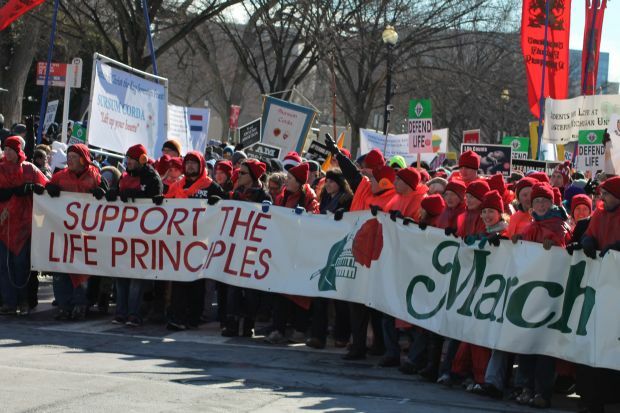 Arriving at the beginning of the week he’d had a meeting with Father Frank Pavone of Priests for Life and attended a USCCB Mass and reception for pro-life directors, and of course the Tuesday Opening Mass and the Rally and March. Some of those who wanted to come to the rally but couldn’t were frustrated. “Our bus was cancelled,” said Pat Stanton, who with his father, John, has never missed the March in 40 years. They started down by automobile, but their windshield wipers kept freezing up. They only got as far as Philadelphia International Airport when they had to give up, but their hearts were in the right place. Coming home from the march, the St. Joseph’s bus picked up another passenger — their pastor, Father Joseph McLoone. “I went down by train and concelebrated at the Mass celebrated at the Shrine by Cardinal Sean O’Malley,” he said.